Discover simple to follow steps for emergency care. Emergency First Response training focuses on building confidence in lay rescuers and increasing their willingness to respond when faced with a medical emergency. Course participants learn simple to follow steps for emergency care and practice applying skills in a non-stressful learning environment. Gain an internationally recognised certification in the basic principles of assisting those with life-threatening injuries. 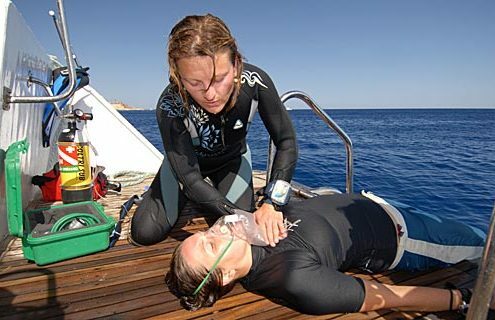 Also includes secondary care for helping with non life-threatening conditions, with techniques such as injury assessment, splinting, bandaging, etc. This course is equally relevant in the home and many workplaces. This course meets the requirements for entry into the PADI Rescue Diver Course. The EFR course is comprised of two section: Primary Care and Secondary Care. Primary Care teaches you the steps and techniques for handling life-threatening emergencies. You’ll practice eight skills for aiding patients who aren’t breathing, have no heartbeat, may have a spinal injury, may be in shock or who may have serious bleeding. You’ll learn to how to perform CPR and continue to monitor the patient, so that you provide every possible chance of survival while waiting for emergency medical services to arrive. Because many medical conditions are not life-threatening and emergency medical services are sometimes delayed or unavailable, Secondary Care teaches you how to provide first aid that eases pain and reduces the risk of further harm. You’ll learn to assess a variety of injuries and illnesses and practice bandaging and splinting. This course also integrates learning how to use an AED (automated external defibrillator). When workplace or governmental requirements specify this training, this course meets the need.